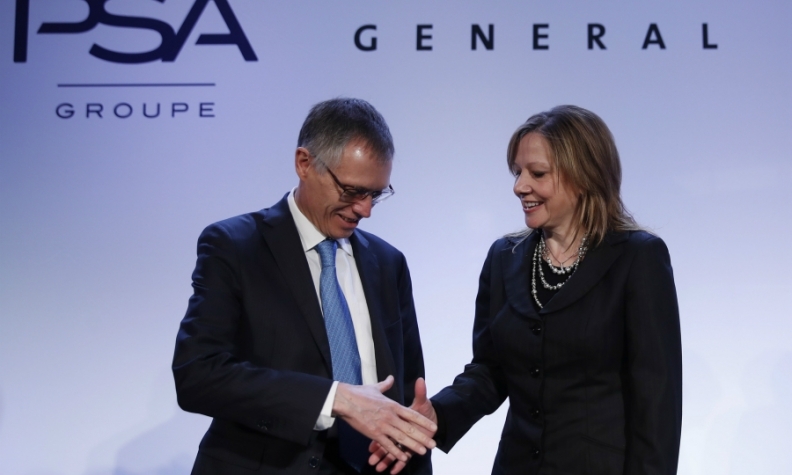 PSA CEO Carlos Tavares (left), shakes hands with GM CEO Mary Barra in Paris ahead of an announcement that the French carmaker would buy Opel. PARIS -- PSA Group agreed on Monday to buy General Motors's Opel unit in a transaction valued at 2.2 billion euros ($2.3 billion). The French automaker vowed to return Opel and its UK-based sister brand, Vauxhall, to profit with an operating margin of 2 percent within three years and 6 percent by 2026, underpinned by 1.7 billion euros in joint cost savings. "We're confident that the Opel/Vauxhall turnaround will significantly accelerate with our support," PSA CEO Carlos Tavares said in a statement. The deal will create Europe's second-largest carmaker in a bid to better compete in the region's saturated market. The deal includes the Opel/Vauxhall and the GM unit's financing operations. BNP Paribas SA will buy 50 percent of the financing business for about 450 million euros. GM, which has owned Opel for almost 90 years, is cutting ties after the division missed a target to break even in 2016, contributing to losses that have totaled about $9 billion since 2009. PSA is betting that adding Opel's roughly 1.2 million in annual deliveries will solidify its own turnaround by spreading the costs for developing new vehicles across a larger network. Job and production cuts are likely as the two companies offer a similar slate of mass-market cars from high-cost locations in Germany, France and the UK. "Having already created together winning products for the European market, we know that Opel/Vauxhall is the right partner," Tavares said in the statement. For GM, exiting Opel will lead to a non-cash charge of $4 billion to $4.5 billion. The deal will continue efforts to shed underperforming assets and will free up about $2 billion in cash to use for share buybacks, according to the statement. The U.S. automaker will also have the right to purchase PSA shares through warrants issued as part of the deal. GM and PSA will continue an agreement for Opel to supply its Australian Holden unit as well as the Buick brand with certain models. The two companies may also cooperate on fuel cell systems. The deal would reinstate PSA as Europe's second-biggest carmaker after Volkswagen Group, pushing it past Renault following a steady decline in market share in recent years. After streamlining operations following a 2014 bailout by the French state and Dongfeng Motor Corp., PSA CEO Tavares is shifting his focus to growth. His vision for a combination of PSA and Opel is to create a "European champion" by slashing costs, combining development efforts and exploiting the appeal of German engineering. With the addition of Opel, PSA is set control 16 percent of the European auto market, putting it behind only VW Group's 24 percent. The deal is the second run at linking the two carmakers after savings from a purchasing and development cooperation project fell short of expectations, prompting Detroit-based GM to sell its 7 percent stake in its French counterpart in 2013. Still, that cooperation is now starting to pay off. In February, Opel unveiled the new Crossland X compact SUV, which shares underpinnings with PSA's Citroen C3 hatchback. A larger Opel SUV is set to follow later this year, which will be built at a PSA facility in France. At Opel, Tavares will seek to replicate the turnaround he engineered at PSA, including cutting jobs, freezing pay and eliminating slow-selling, unprofitable models. The French company went from net losses starting in 2012 to profit in 2015, and generated 2.7 billion euros in cash in 2016. This year, for the first time since 2011, the company will pay a dividend.